Synopsis: The fifth installment in the Paranormal Activity franchise departs from the original format to deliver a new spin on the classic formula. A few years back, the Paranormal Activity franchise breathed new life into the dead horse that was the found footage horror genre with its simple storylines that led to a complex mythology, at least until the wheels came off in the fourth movie. Luckily for horror fans, Paranormal Activity: The Marked Ones shows that the series still has plenty of life…and scares. Paranormal Activity: The Marked Ones is centered on a pair of teenaged friends, Jesse (newcomer Andrew Jacobs) and Hector (Jorge Diaz from “East Los High”), living in a Latino neighborhood in Oxnard, California. Jesse has just graduated high school and his family is partying hard when the boys see one of their classmates, Oscar (Coyote‘s Carlos Pratts), coming out of the apartment of the creepy downstairs neighbor lady. When the neighbor turns up dead, Jesse and Hector sneak into her apartment to snoop around. They find a slew of occult artifacts and witchcraft paraphernalia that belonged to the dead woman. They are frightened away, but something follows them home. Jesse soon begins to exhibit strange, superhero like powers that amuse and confuse the boys. Jesse’s new abilities come with a price, however, as he soon begins losing control of his mind and body. Along with Jesse’s grandmother (Renee Victor from “Weeds”) and sister (first time actress Gabrielle Walsh), Hector struggles to save his friend from whatever is trying to take him. 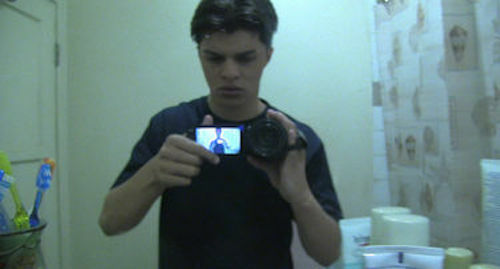 Although Christopher Landon (Burning Palms) has had a hand in the writing of every Paranormal Activity entry since the second, The Marked Ones is the first film in the franchise that he has directed as well. The film is being categorized as a spinoff rather than a sequel, and it is a bit of a departure from the rest of the series. Aside from being Latino, the main characters are also younger than those from the older films, making it feel a bit like other shaky-cam teen movies like Project X and Chronicle. The Marked Ones takes place in the same cinematic universe as the other Paranormal Activity movies, following the same mythology, but has a much wider scope. It’s still a found footage film, but the characters (and camera) are much more mobile; whereas the earlier films tended to spend most of the time in one setting, The Marked Ones has Jesse and Hector grabbing the camera and wandering all over the city. Because of this fact, it’s also the most motion-sickness inspiring of the series – some sequences are downright Blair Witch-like. It also leads the viewer to question why they are recording everything; one of the biggest weaknesses of the found footage subgenre is inorganic reasoning for the existence of the footage in the first place, and The Marked Ones never lets the audience know why the tape is rolling. Still, these are flaws that are limitations of the style, and The Marked Ones can’t be blamed too much for that. It is still a breath of fresh air for a franchise that really, truly needed it. Paranormal Activity: The Marked Ones is definitely a Paranormal Activity movie. Even though it doesn’t have all of the familiar faces from the rest of the series (although, a few characters cross over…but enough spoilers! ), it has all the same tension and suspense, punctuated by the same heart stopping scares. It’s a new perspective, giving fans a look at how another, very different family deals with the same situation as the characters from the other films. The Marked Ones winks and nods enough to the other Paranormal Activity films that some knowledge is necessary for full enjoyment, but that’s simply the film catering to its target audience – the movie doesn’t concern itself with attracting new fans, it assumes that the viewer is already versed in the history. Fans of the Paranormal Activity series, particularly those who were disappointed by the last installment, will have their faith restored by this film. The cherry on top is the ending; the final minutes of The Marked Ones is nothing short of genius – true brilliance. 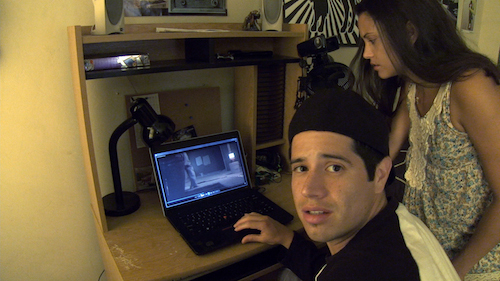 Paranormal Activity: The Marked Ones inspires hope for Paranormal Activity 5, due out later this year. The Paranormal Activity movies have a proven recipe for scares, and The Marked Ones follows it pretty closely. There are plenty of jump scares, some genuine and some red-herring, but the real terror comes from the waiting; there are long periods of agonizing suspense that just leaves the viewer sitting there in silence, waiting for whatever is to come. The audience knows it’s coming, and it still scares the pants off of them. After four movies, one would think that the formula would get old. However, it surprisingly does not. Paranormal Activity: The Marked Ones is full of the white-knuckle suspense and scream-out-loud scares that audiences have come to expect from the franchise.